Double Robotics – Crossing the Chasm? – LET'S TALK ROBOTS! Double Robotics – Crossing the Chasm? Double Robotics, the Ycombinator company behind ‘wheels for the ipad’ is a fantastic showcase of the new breed of affordable consumer robotics. But can they cross the chasm? These guys know how to create a beautiful accessible easy to use robot. And so far, also how to market it. 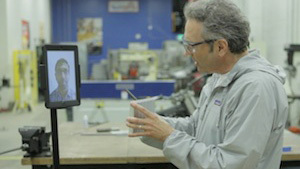 Double Robotics’ first production run has sold out with over $1 million in orders. This combination of good initial marketing, affordable price point and getting preorders has allowed Double Robotics to avoid the Series A funding bottleneck. Good news? In general, yes. However, I don’t believe that Double Robotics have found product/market fit. They’re using a shotgun strategy to cross the chasm, to make the move from early tech adopters to mainstream customers. It might work. This is a challenge many robotics startups will face. Do you focus on selling your robot as a completely new solution with an unknown product/market fit? Or do you spend more time doing customer development, creating product/market fit in a specific vertical? Ultimately, this raises the question of crossing the chasm vs race to the bottom. Geoffrey Moore’s concept of a chasm (to be crossed) in the classic adoption cycle describes the difference between early adopter customers and the general market, and the resulting dilemma. Selling to the first segment of your cycle doesn’t guarantee selling to all segments, in spite of the hype your early evangelists drum up. Double are pitching a problem solved – cheap easy to use telerobotics – rather than a product for specific market uses. When someone discovers a viable business model, then Double may have the early mover advantage but it rapidly becomes a race to the bottom. The race to the bottom, like the tragedy of the commons and the prisoner’s dilemma, occurs when communal good is overshadowed by individual greed. The moment that a product/market fit for cheap telerobotics emerges, competition for those market segments will inspire ever cheaper solutions. Robotic vacuum cleaners have been in a similar position. Originally, iRobot, Evolution Robotics/Mint and Neato, were specialist robotics companies with vacuum cleaners as their primary product. Now companies with robotic vacuum cleaners number in the dozens, from cut price clones like Metapo and iTouchless to large consumer appliance/electronics manufacturers like Samsung. First mover companies have to compete to retain market share with companies that don’t fund research, development, or support and this can in turn damage overall market penetration. Less tech savvy consumers (like my family) have gone to purchase a whizz-bang robot vac and come away from the experience disappointed with the lack of features, the performance, robustness and reliability. Ipods might be mp3 players but not all mp3 players are ipods. If an idea finally matures, like robot vacuum cleaners, then the originals are also competing against large companies who can access economies of scale including in support, like Samsung. Robotics is in an interesting situation – does it become subsumed into the next product iteration, where every product has robotic features and none worth talking about. Cars are a good example. Or do the ‘robotic’ features carry enough value for niche (robotics) companies to flourish? Is ‘wheels for your ipad’ going to be a robot company or just another ipad accessory? And can Double Robotics be more than just an early adopter robot toy?